Glosser enlisted in the United States Army in 2000. During his enlisted time he served at the Defense Language Institute, the 82nd Airborne Division, and the 173d Airborne Brigade Combat Team, achieving the rank of Staff Sergeant. During his enlisted time, Glosser deployed four times (OEF III, OIF I, OEF VI and OEF VIII) where he conducted full spectrum human intelligence (HUMINT) operations. Glosser attended the Officer’s Candidate School at Fort Benning, Georgia and was commissioned as a Second Lieutenant to the Military Intelligence Branch in 2008. His first officer assignment was with the 12th Combat Aviation Brigade, Katterbach, Germany, where he served as the brigade assistant S-2 and deployed to Iraq in support of OIF 09-11. In 2012 Glosser attended the MI Captain Career Course (MICCC) and the HUMINT Officer Course at Ft. Huachuca, AZ, where he was awarded a secondary MOS as a 35F – HUMINT Officer. From September 2012 to September 2013, he was assigned as the S-2 for the 94th Military Police Battalion, USAG Humphreys, Republic of Korea. 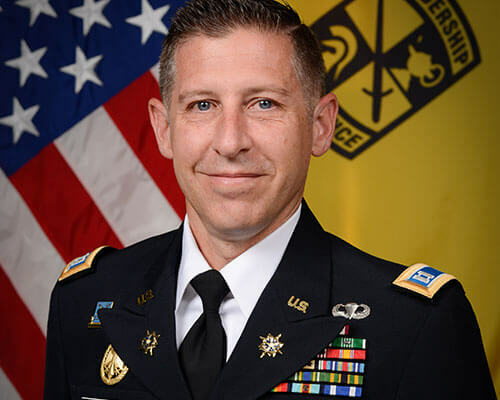 In September 2013, Glosser arrived to U.S. Arnorth, Fort Sam Houston where he served in G2 Plans from September 2013 to February 2014, Operations Company Commander from February 2014 to January 2015, and Headquarters Support Company Commander from February 2015 to June 2016. From July 2016 to June 2018, he returned to the Republic of Korea where he served as a Targeting Officer for the Combined Joint Fires Element, United States Forces Korea. Glosser is currently the Executive Officer and Assistant Professor of Military Science at St. Mary’s University. Glosser is married to the former Andrea Dixon of Atlanta, Georgia. Glosser and Andrea are extremely proud parents of their talented twins Theone and Maximus and their youngest child Jaxon. CPT Glosser’s awards and decorations include the Joint Service Commendation Medal (with one oak leaf cluster), Army Commendation Medal (with five oak leaf clusters), Army Achievement Medal (with two oak leaf clusters), Army Good Conduct Medal, National Defense Service Medal, Afghan Campaign Medal, Iraq Campaign Medal, Global War on Terrorism Expeditionary and Service Medals, Korea Defense Service Medal, NCO Professional Development Ribbon, Army Service Ribbon, Overseas Service Ribbon, NATO ISAF Medal, German Armed Forces Proficiency Badge (gold), Parachutist Badge.